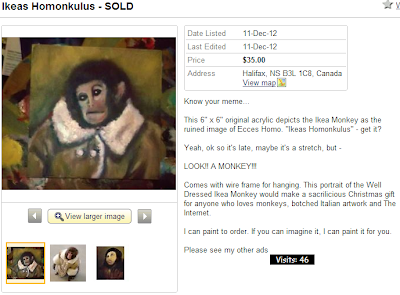 A Halifax artist uses the Ikea Monkey incident to show off his or her painting skills, illustrating Darwin the Rhesus Monkey in the style of the mangled Jesus Fresco. It's a natural combination, and it's on Kijiji. Ikea Monkey to hang on your wall. This 6" x 6" original acrylic depicts the Ikea Monkey as the ruined image of Ecces Homo. "Ikeas Homonkulus" - get it? Comes with wire frame for hanging. This portrait of the Well Dressed Ikea Monkey would make a sacrilicious Christmas gift for anyone who loves monkeys, botched Italian artwork and The Internet. I can paint to order. If you can imagine it, I can paint it for you. reddit calls me an "obscure Nova Scotian Artist"
I painted that Ikeas Homonkulus and am willing to reproduce it, $80. I am going to do a couple of big ones and put them on ebay before this 15 minutes is up. I want to make enough money to buy a shearling coat.